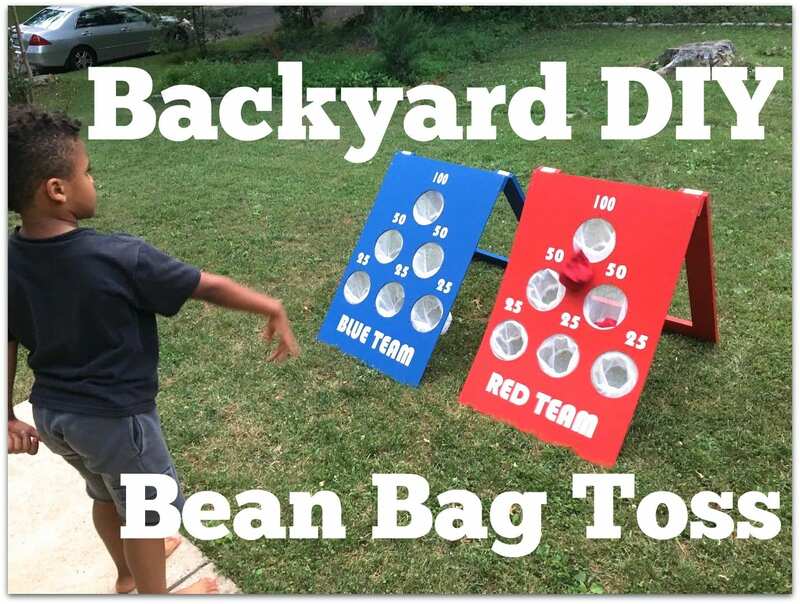 It’s about time that our backyard got some fun games, like this DIY backyard bean bag toss game! Watch This Project in Action! The thing that drew me to our house was its backyard. Nearly 7 years ago we were moving from a condo with very little space into a home twice the size with this amazing backyard. I fantasized about all the things the kids could do in the backyard…the impressive swing set I would buy them…only to leave it bare for years! So you know what happened–the kids stayed inside…played electronics…and now, all they want to do is play video games and watch YouTube. 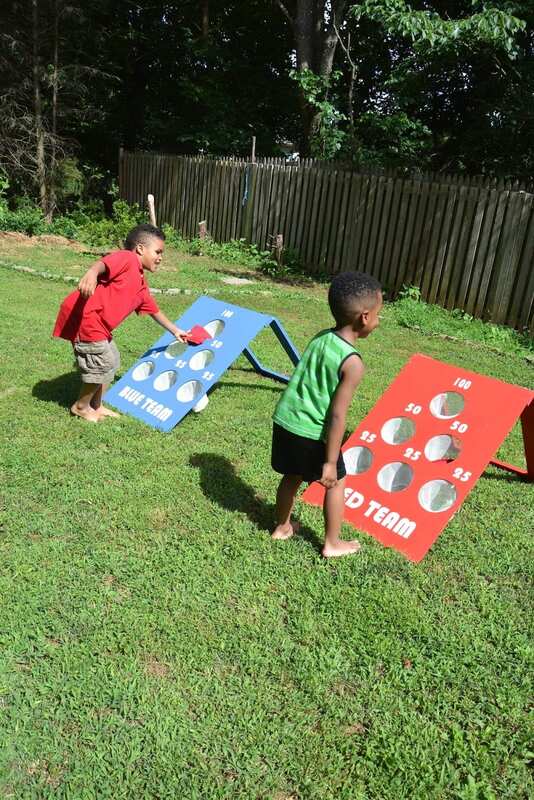 Summer is here and I wanted to get the kids outside, but also have some fun activities for them to do when having friends over. 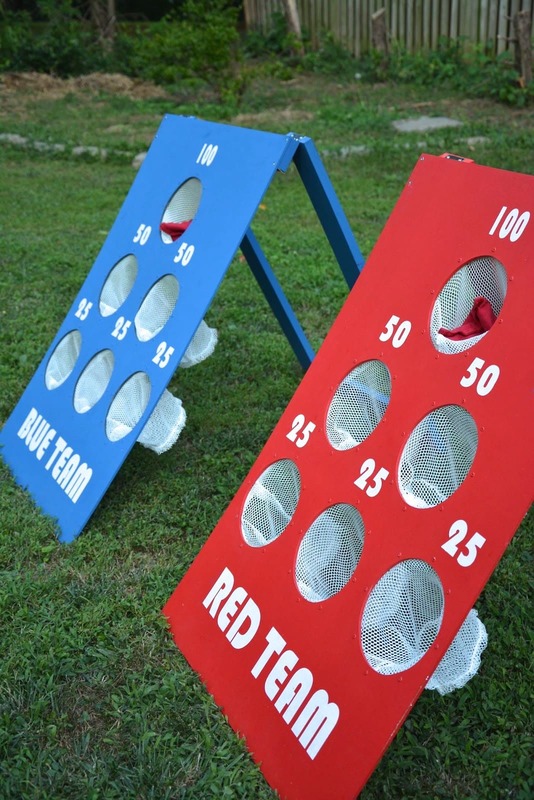 With just some plywood, paint, a riveter, rivets, power tools, and mesh, I easily created this fun DIY backyard DIY bean bag toss game. Now, our backyard doesn’t have to be so boring! 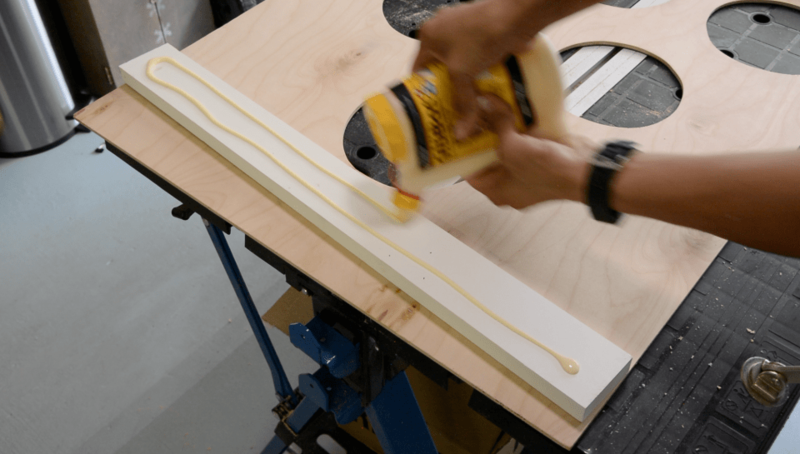 You’ll need two pieces of 1/4” plywood. I’ve found that 1/4” is perfect for to use when joining fabric to wood. 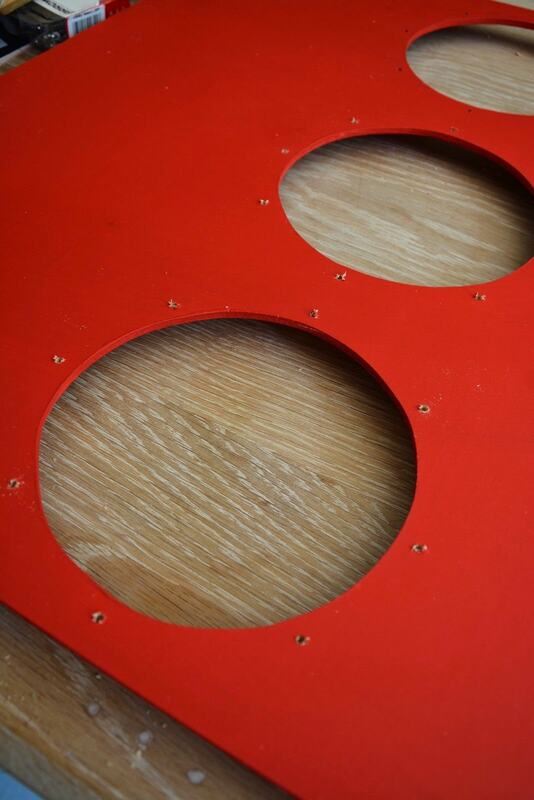 Rivets aren’t very long, so the thickest wood you can use is 1/4″. I also used this riveter by Arrow Fastener, which was provided by Arrow Fastener. By using rivets, I was able to join mesh pockets to the plywood. Rivets come in 3 sizes: short, medium, and long. When using 1/4” plywood, I’ve found that the medium rivets work best, so that’s what we’re going to use for this project. 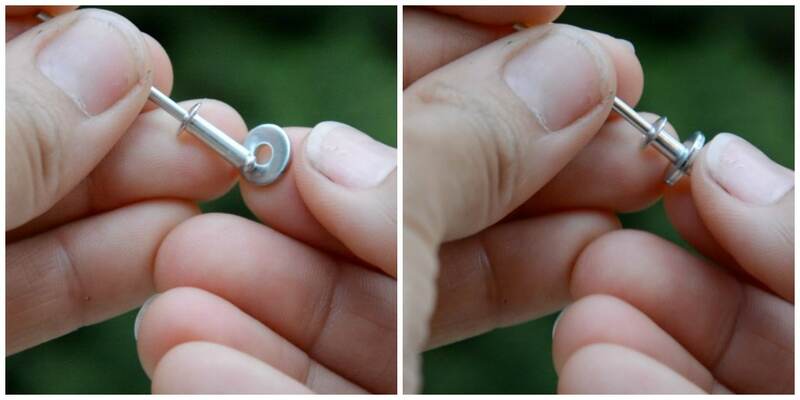 You’ll also need rivet washers. These are important because the wood and fabric will be sandwiched between the rivet and rivet washer to hold them together. You’ll also need about a yard of mesh fabric that you can pick up from the fabric store. And in order to drill the holes, we’ll use a drill bit that about the same size as the rivets we’ll be using, which is 1/8” drill bit. On the packet of rivets, it will tell you the size of the rivets, so I tend to use a drill bit of the same diameter. 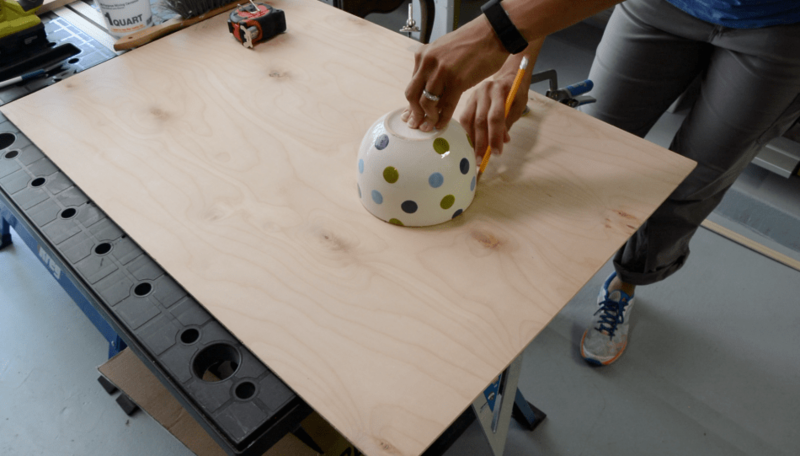 The two power tools you’ll need for this project is a jigsaw for cutting and a power drill for drilling. 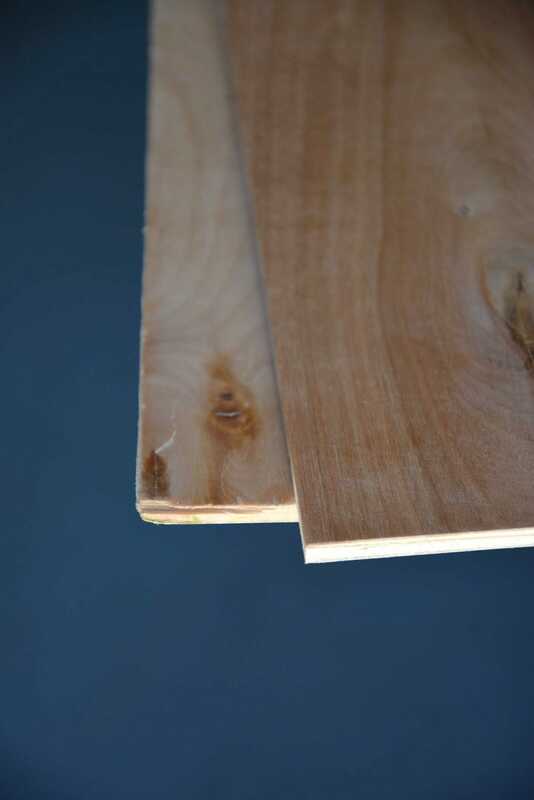 The 2 sheets of 1/4” plywood come in 48” heights. We don’t want our bean bag games quite so tall, so start by cutting them down. I’m making mine 36”. There’s no right or wrong size of the bean bag holes. Just make sure they’ll be large enough. I used a bowl from my kitchen to trace 6 holes. I centered the first, measuring down about 7 inches. 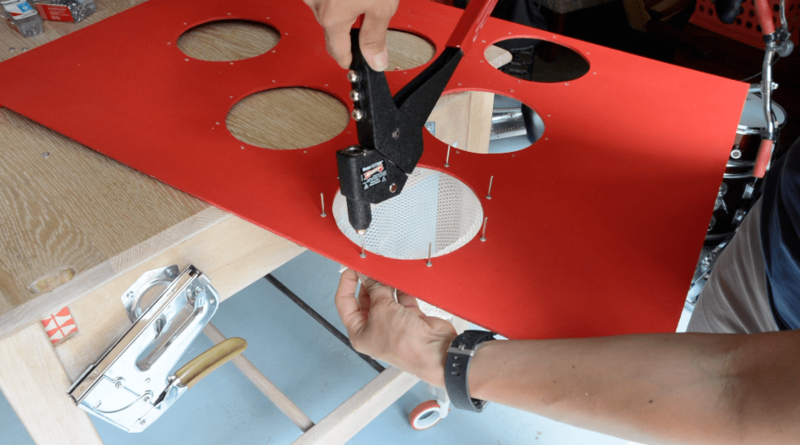 In order to cut out the bean bag holes, I had to first drill a hole in the circle so that I could insert my jigsaw blade to begin cutting. I did this for all 12 holes, 6 on each bean bag game. Because the plywood is thin, you’ll have to add a board to the top. I used glue, but it’s best to use glue and screws to screw it. 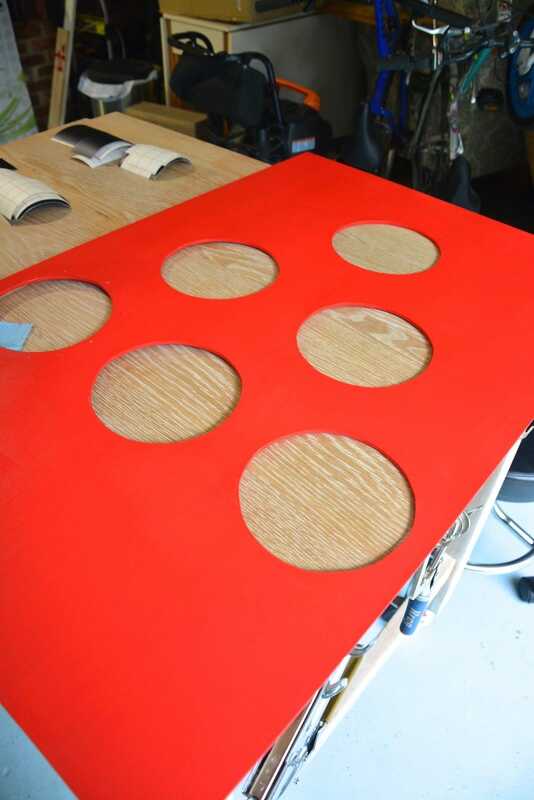 This board will be the board upon which to attach the hinges for the kickstands. I later realized that wood glue wasn’t going to be enough, so I recommend using glue and a couple screws on each side. 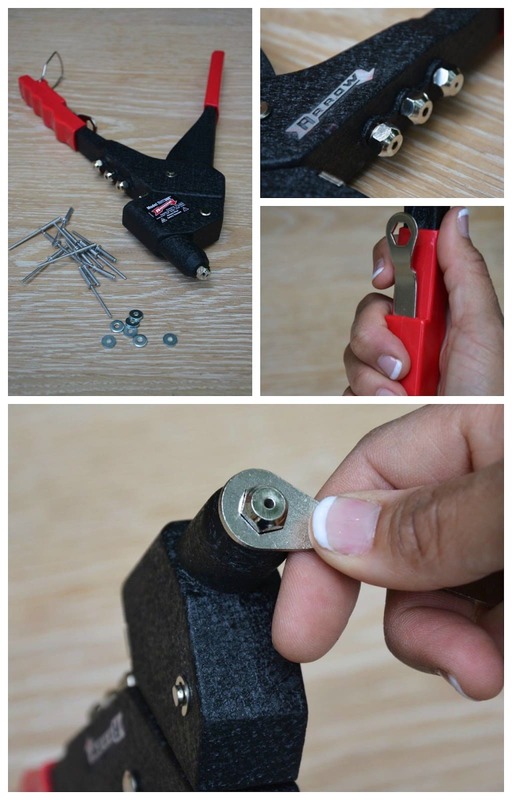 If you don’t have a sewing machine, no worries. You may use no-sew tape. 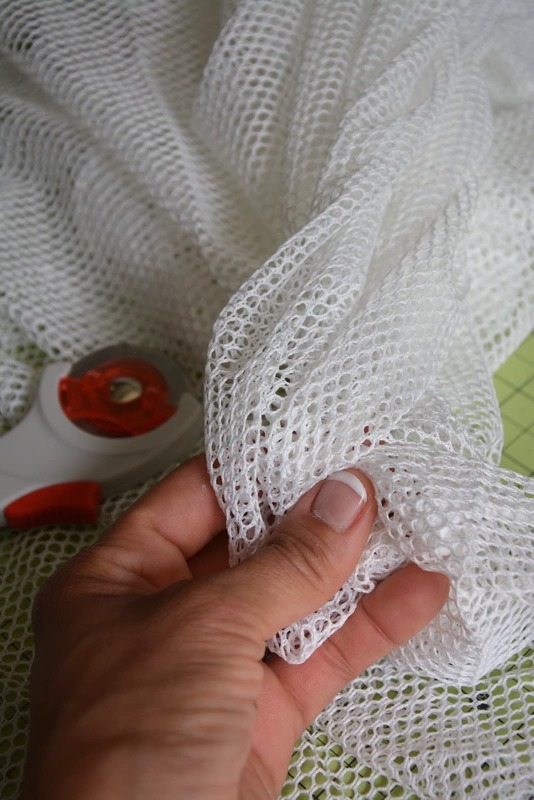 If you’re using mesh, you’ll need to use a long zigzag stitch. 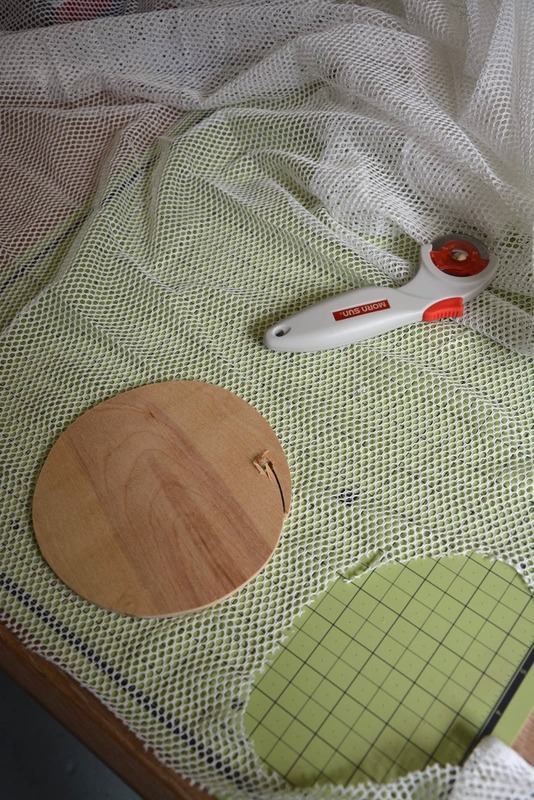 I used the wooden circles as a template and cut out 12 mesh circles. I also cut 12 long strips of mesh that would also make up the pockets. I folded the mesh strips in half and used a long zigzag stitch to sew together the one edge. If you don’t have a sewing machine, no problem. Just use no-sew fabric tape to join fabric together. It’s pretty simple. Then I used the zigzag stitch to join a mesh circle onto the end. You may actually paint the wood later, but I painted the wood sooner so that it could dry thoroughly. I didn’t want the paint to ruin the mesh. TIP: The painting goes much faster if you use a roller! 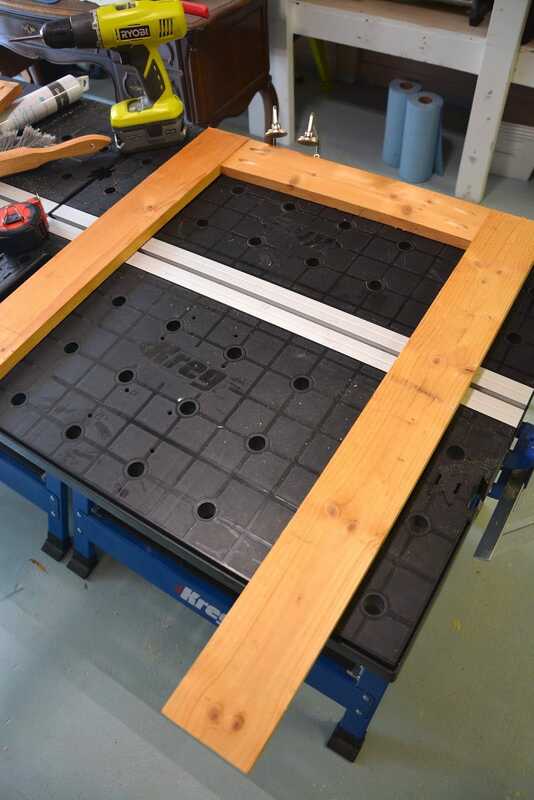 Before drilling holes for the rivets, I cut 1×4 boards using a miter saw, but you can just your jigsaw, too. This was scrap wood that I had on hand and it was perfect for making the kickstands that would support the bean bag games. I used my pocket hole jig to drill pocket holes to screw them together, but you can easily use wood glue, too. The kickstand should be a bit shorter than the 36” bean bag boards so that, when reclined, it the bean bag game rests at an angle. 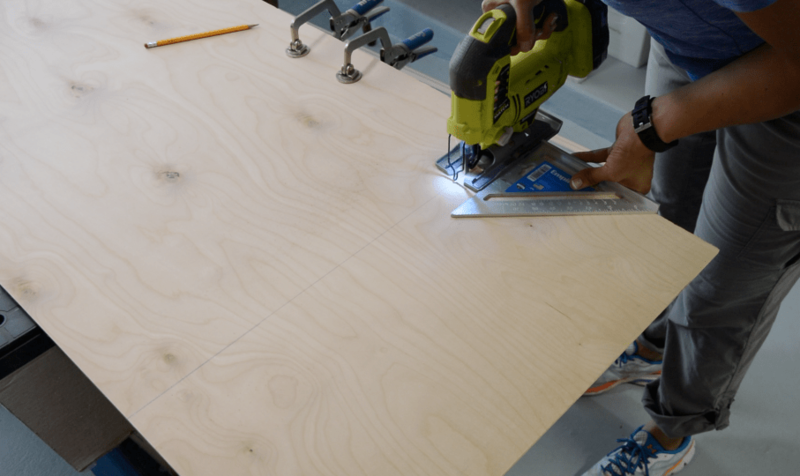 Before drilling the holes for the rivets, place a piece of scrap wood underneath of the plywood to prevent tear out on the other side from drilling. 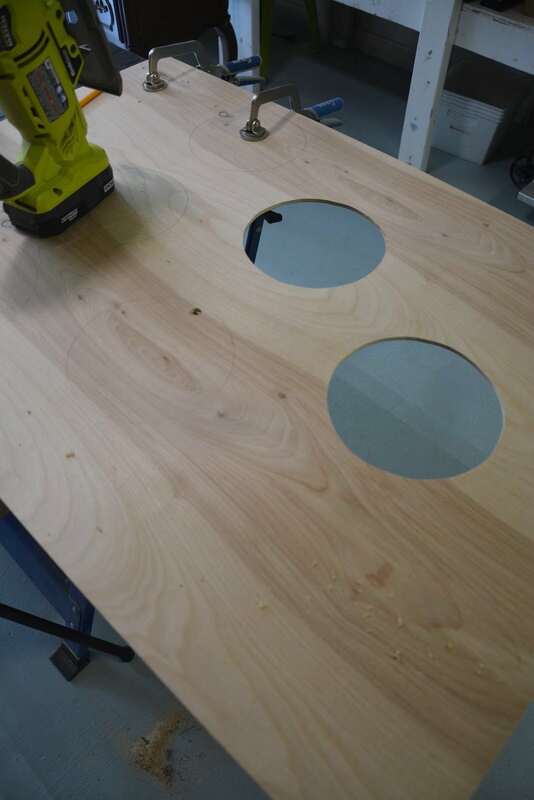 Drill 8 holes around each circle: at 12, 6, 3, and 9 o’clock, and spaced evenly between those points. 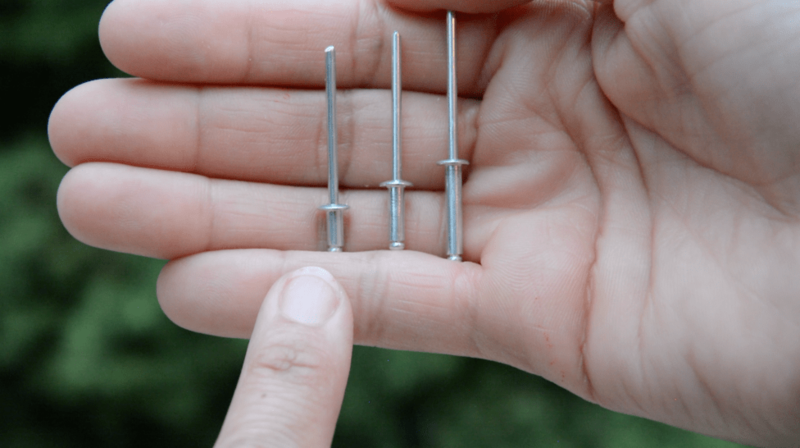 Medium length rivets work best for ¼” plywood. 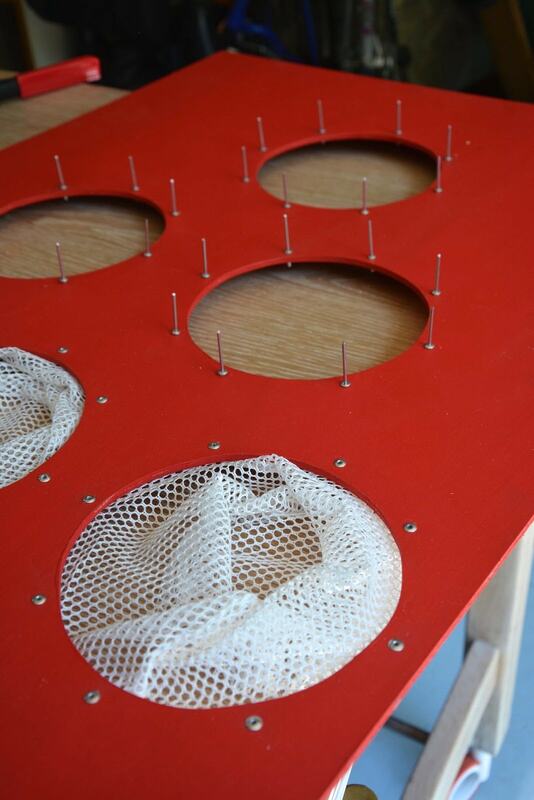 Simply insert them into the holes and hook the mesh fabric onto the rivets. 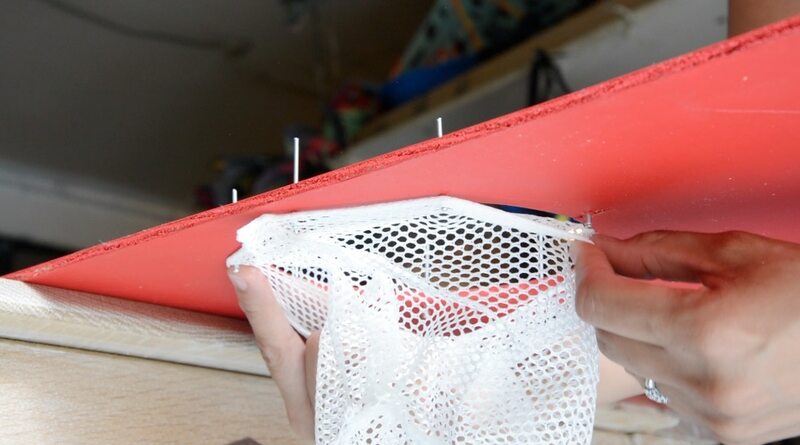 If you’re using another type of fabric, just create small holes to hook onto the fabric. Be sure to hold the washers in place. 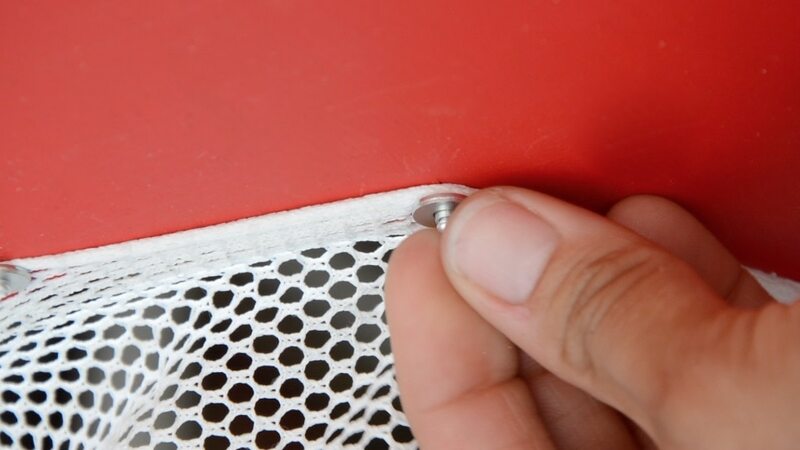 As you squeeze the handles of the riveter, the rivet will begin to expand, pulling the washer tight and secure against the mesh. With a couple of squeezes, the long rivet snaps off, leaving the fabric secured to the wood. 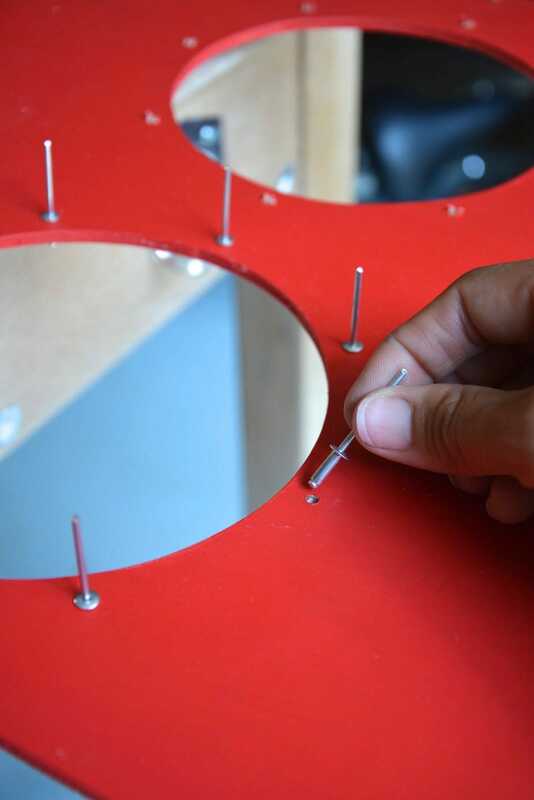 After attaching a bunch of rivets, you’ll be left with rivets showing on your project. If that’s the look you’re going for, great! 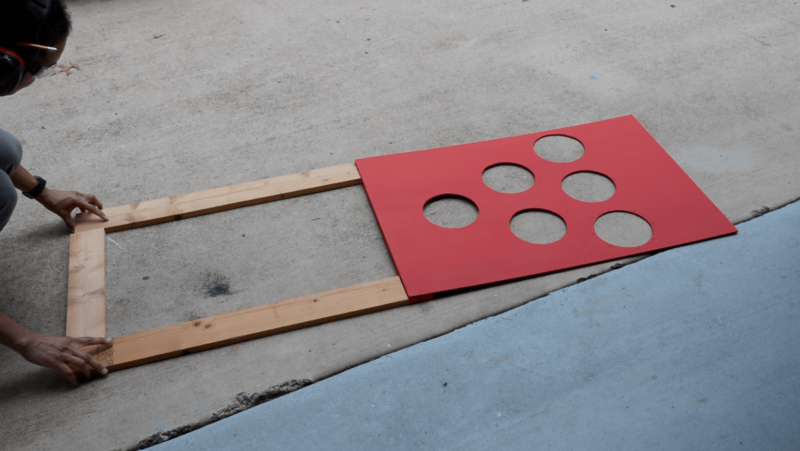 If not, painting the rivets will blend them in, making the bean bag toss look clean and seamless. I’ve got a cutting machine that easily makes stencils, but you don’t need something fancy. You can use ready-made stencils to add point values and things like RED TEAm and BLUE TEAM. 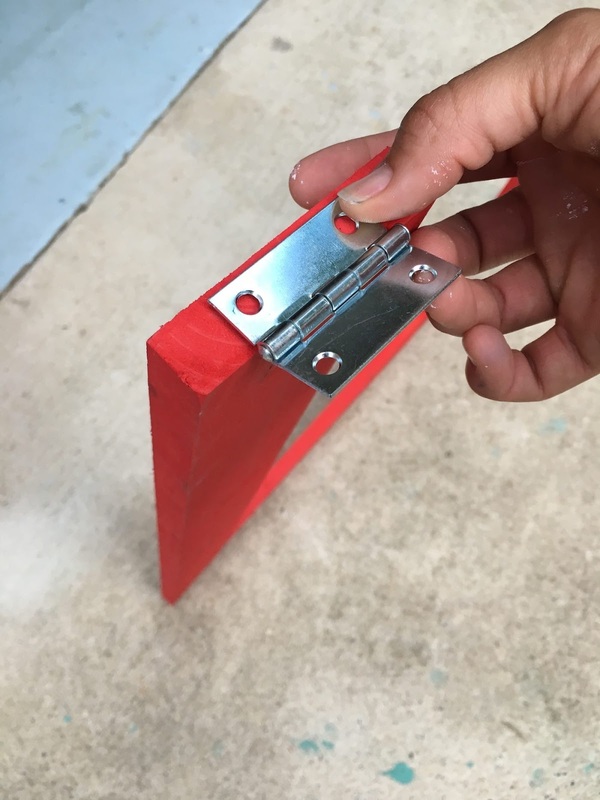 On the ends of the kickstand, attach a hinge to each edge. Then, attach the other side of the hinge to the bean bag game. The bean bag game was a big hit with Kojo and his friend! 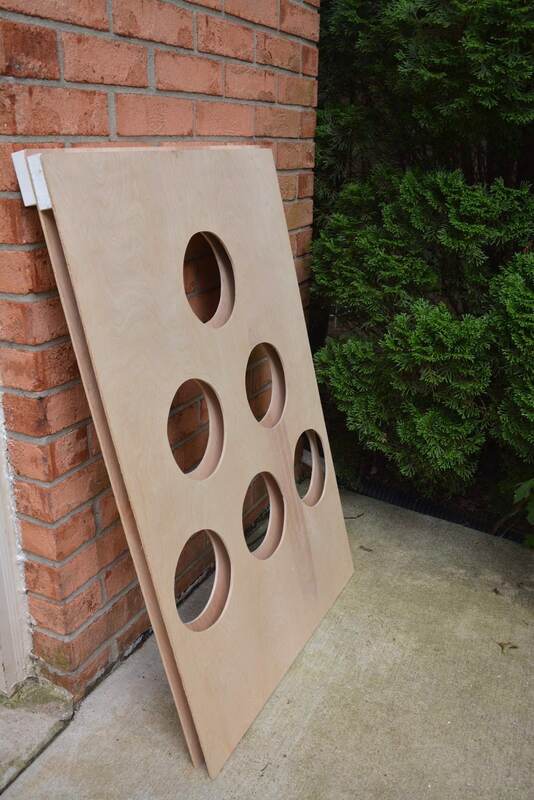 I found that the heavy-duty bean bags (purchased on Amazon) were too heavy for the 1/4 plywood, so I’ll likely find some lighter bean bags to use or lighter balls to accommodate for the thin 1/4″ plywood. 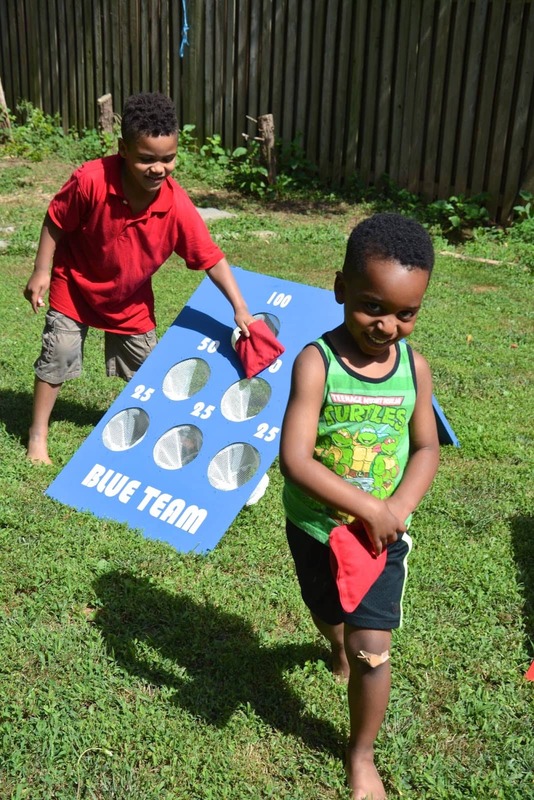 But overall, it turned out great and it gives the kids something fun to do in the back yard! This is the second project I have done using a riveter to join fabric to wood, and I have to admit, it’s becoming one of my favorite tools to use! (Click here to see how I used a riveter to make a wooden backpack). Check Out More Outdoor Ideas and Kids Ideas! To learn more about the riveter from Arrow Fastener, find them at ArrowFastener.com. 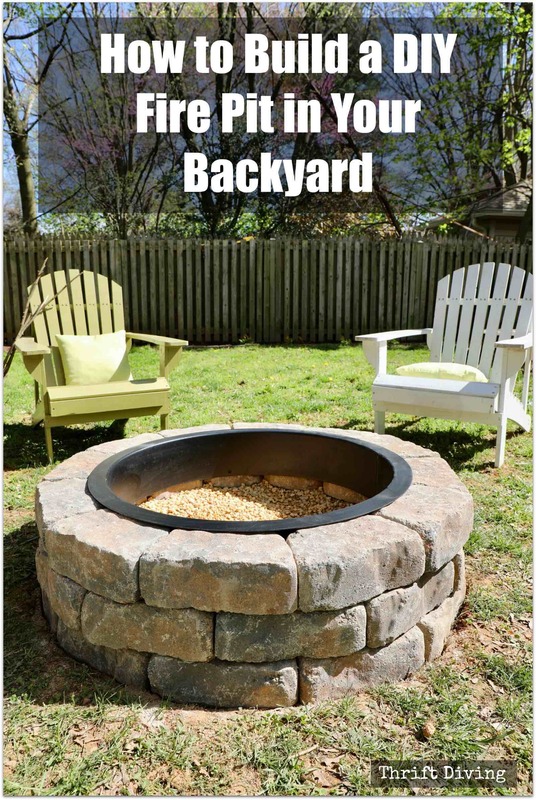 Do you have some fun DIY backyard ideas for your family this summer? Leave a comment and let’s talk summer fun ideas! This project was brought to you in partnership with Arrow Fastener. All opinions belong to Thrift Diving. what are the rules to the game? so FUN! i’d love to play this! Awesome project Serena! 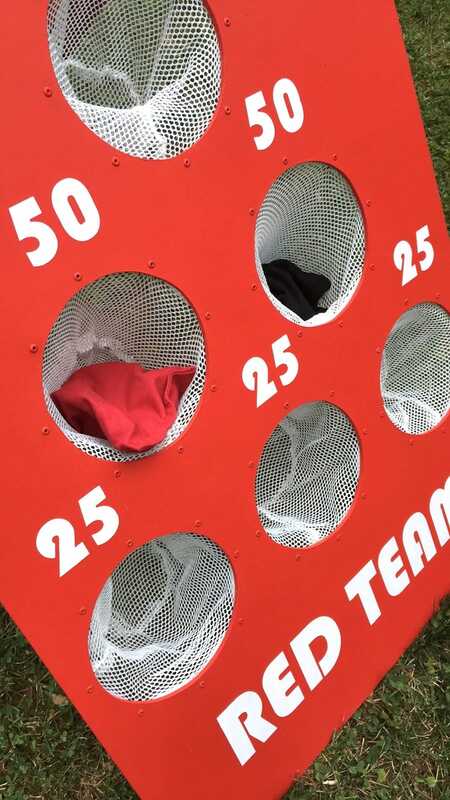 I especially love the little mesh cups; no more arguing over which hole the bean bag went through! Wow I’m really impressed. 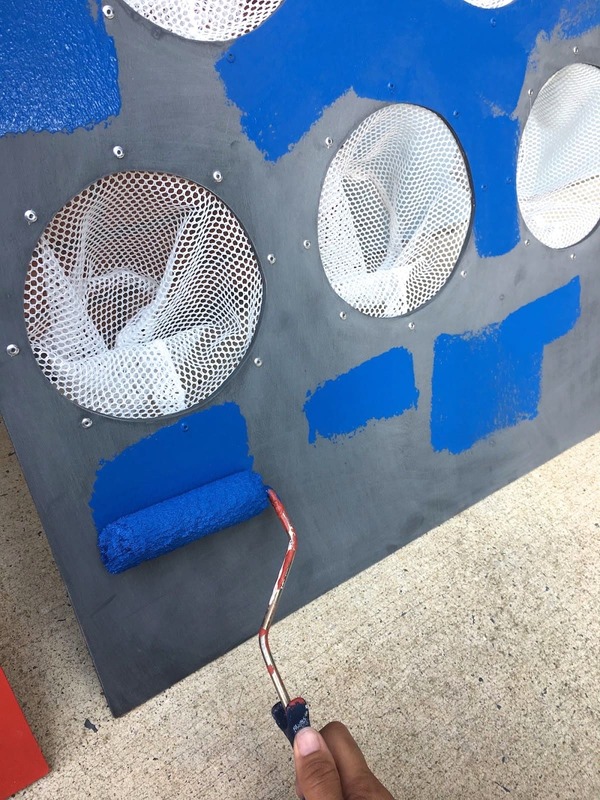 This project looks a real fun for the kids and not so hard to do for the parents. I’m going to discuss it at home and may give it a try. Thanks for sharing! Well done! Looks like a lot of fun. I want to try to make this!! 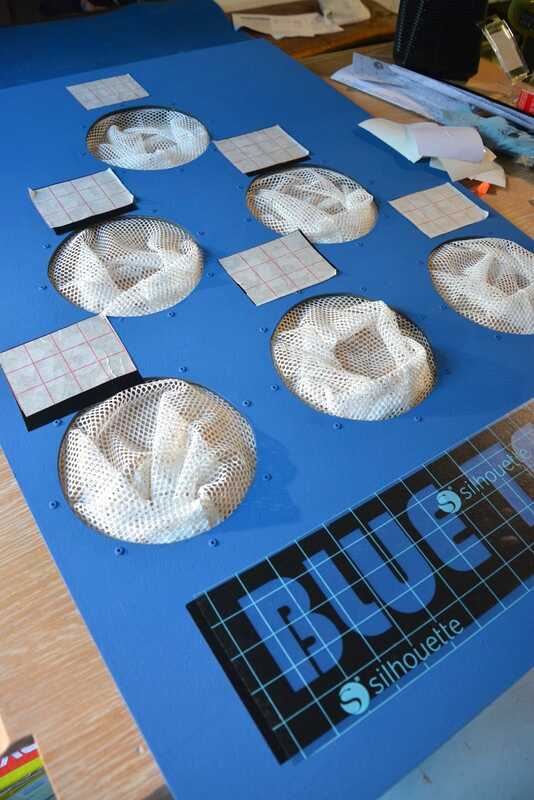 Looks like a great project that would result in lots of fun for kids and adults ? It definitely is, Eva! And you don’t need any heavy-duty power tools–just the jigsaw and a riveter! Thanks, Judy! It was fun making it, too, as well as playing! A friend has a great idea, too: instead of buying lighter bean bags, she suggested just opening these and letting some of the sand out and then re-sew them up. Brilliant! 🙂 Thanks for commenting!! Oh my! Best tutorial for this I have seen! I work at a middle school and we were looking for a tutorial to make some of these last year and never found one that was so easy! Great job!! Awww….that makes me so happy, Sherry! I’m sorry it’s so late of a tutorial! LOL. Maybe this coming school year! 🙂 Be sure to use balls/bean bags that aren’t so heavy so that they don’t shake when the bean bags are tossed. But you could also add another piece of wood to the back of the front, near the ground, the weight it a little more. But these would be great for middle schoolers, too! 🙂 Thanks for the awesome feedback!! Girl, I’ve been following you for some time now. You have really ventured out and got out of your comfort zone (chalk paint to power tools) — how cool is that! I only wish I had the “”umph” to do that. You really are so creative and this is just too cute! Tina, you are so awesome!! That’s quite the observation and you are right! 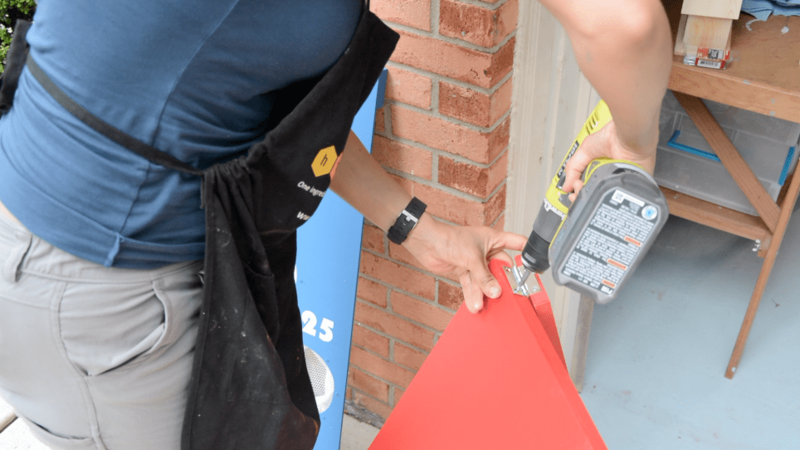 I started with only painting furniture, but my love of DIY grew and now it’s all about paint AND power tools (and hand tools like the riveter). It’s so much fun to discover new tools and tips and techniques, and I my goal is for my readers to make that journey, too! To help them move from painting to power tools, as well! You’ve helped me see that so clearly. Thank you!